In the late 1930s, the Dutch government was looking for a new fighter. 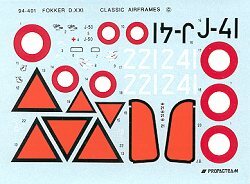 Always wanting to buy locally, it turned to Fokker aircraft for a design that would meet specifications. Foremost was ease of maintenance and repair as well as good handling and adequate speed. What resulted was an aircraft in many ways typical of mid-late 1930s design. Tube frame fuselage with fabric covering on the back half as well as a braced tailplane assembly. Fixed landing gear were chosen as the extra weight of retractable gear was felt to be a detriment. Eventually one aircraft was fitted with retractable gear, but never put in production. Power was from a British Bristol engine of around 800hp. Not exactly a world beater, but more than adequate. Armament was four 7.7mm machine guns in the Dutch version. The aircraft was also exported and built in Denmark and Finland. The Danes wanted to use Masden 20mm cannon in place of the four machine guns. In terms of air combat, the Dutch had some success with the planes against the Germans as the D.XXI was much more maneuverable than the Bf-109E. However they were eventually overwhelmed by sheer numbers. The Danes barely got theirs off the ground. Finland had more success with them. The ruggedness of design was such that it was able to handle the extremes of temperature fairly well. It was also well piloted and quite successful against the Russians. Folks, this is the kit that started it all for Classic Airframes. 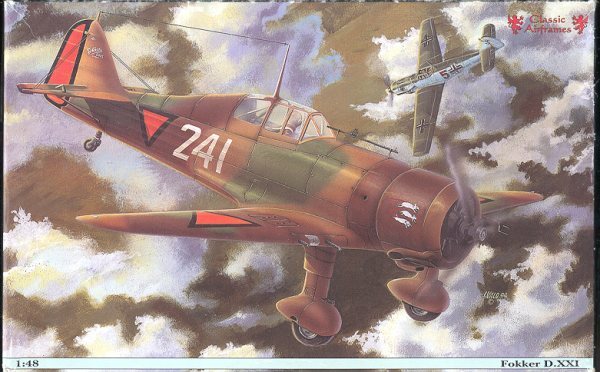 A need was seen by Jules Bringuier for a line of kits featuring aircraft that had been requested for years in 1/48, but for which there was not enough demand seen by the major players in the modeling world. He realized that scale aircraft modeling was not the same in the 90s as it was in the 60s. Modelers were fewer, had more money to spend, and demanded a higher standard of accuracy. The aftermarket brass and resin companies were selling products like hot cakes. These items were able to provide the level of detail that was demanded. Low pressure injection molded kits (i.e. short run) were gaining in popularity. All of these items could be made at a reasonable cost in Eastern Europe, especially the Czech Republic, imported, mated with US boxes and quality decals and sold to enthusiasts. Thus was born Classic Airframes. The company has gone on to bring us kits of planes that we'd never see from the likes of Monogram, Heller, Hasegawa or Italeri. I don't know a single modeler that isn't glad that Classic Airframes had the foresight and fortitude to enter the market. So let's take a look at this ground breaking kit. Unlike current CA kits, this one relies on etched brass for most of the detailing. In fact, there is another half sheet of the stuff not shown in the image. Conversely, resin is limited to the control stick and the rocker arm clearance bumps on the cowling. Something also not found on current kits are a few metal parts for the tail wheel assembly and the 20mm cannon. There is a single vacuformed canopy. Plastic parts are really just for the major airframe parts, similar to today's kits. There is flash everywhere so clean up is a major part of assembly preparation. Detailing is fine engraved lines, though those are not consistent, disappearing in some places. It really looks pretty simple compared to the current breed of Classic Airframes kits. My example was bought second-hand so the previous owner had clipped the major airframe parts from the sprue. The attachment points are large. Thanks to the large etched brass sheets, a lot of bending and supergluing will be needed to complete this kit. The instructions are more than adequate to build the kit and any differences between the two types of aircraft are noted. The decals are by Propagteam and for two aircraft. One a Dutch version as shown on the box art, and the other for a Danish version with twin Masden 20mm cannon under each wing. You cannot build a Finnish-built version from this kit as the canopy area and rudder, among others) are not the proper shape. It is pretty obvious that this kit was a resounding success. It sold quickly and is one kit that is generally difficult to find. Easy to build it really is not, but if you do a good job of it, the resulting model is a real beauty! If you would like your product reviewed fairly and quickly by a site that has over 100,000 visits a month, please contact me or see other details in the Note to Contributors.